The purpose of estate planning is to consider what you want to have happen to your accounts and possessions after you pass away and to put plans in place to ensure your wishes are met. Nowadays, we have numerous digital accounts to look after as well. 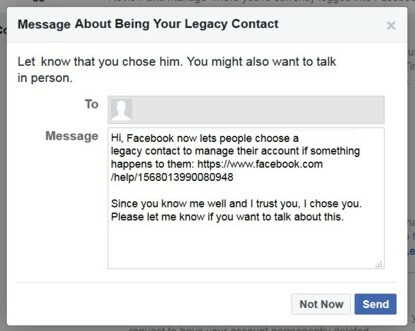 In February 2015, Facebook added the “Legacy Contact” feature that allows you to grant a Facebook Friend access to your Facebook page after you have passed away. 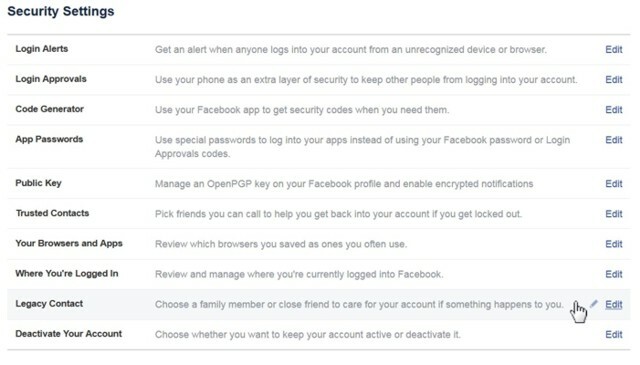 Facebook currently has two options for what can happen to your account: it can be memorialized or it can be permanently deleted. Designating a Legacy Contact allows your friend to choose between these two options. Legacy contacts can make limited changes to a Memorialized page. Login to Facebook and then, in the upper right corner, click on the down arrow to reveal your options drop-down menu. 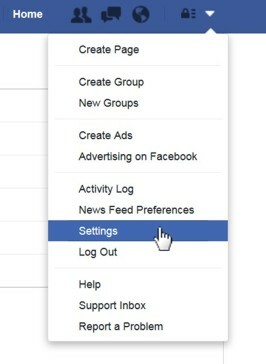 Then, click on “Settings” to open your Facebook settings. Once your Settings menu is open, click on the “Security” tab on the left side to open your Security settings. Once your Security settings are open, you will see a list of settings that you can edit. Near the bottom is “Legacy Contact,” which you can click on to edit. In the search box that appears, type the name of the friend you chose to be your legacy contact. Friends who match your search terms will appear as you type. When you see the friend you would like to designate as your legacy contact, click on them. This will put their information in the input box. With your selected legacy contact in the input box, click the “Add” button next to their name. Step Six: Decide if you want to send them a message. After clicking “Add”, a window will pop up asking you if you want to send a message to your chosen legacy contact. The box will pre-fill with a message, which you can edit if you would like. If you do not want to send a message, you can click “Not Now” instead to close the pop-up window. Step Seven: Review other settings. Do you want your legacy contact to be able to download a copy of your data? This will allow them to preserve your information offline, for example. 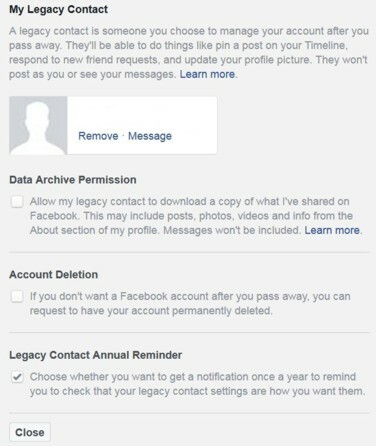 Do you always want your Facebook account to be deleted after you pass away? Checking this box will remove the option of your legacy contact making your page a memorial wall. Do you want to be reminded annually to review your selection? After you have finished selecting these options, you can simply navigate away from this page. Your settings are saved as you have selected them.